Ionized polymer synballistic attack platform. The system’s lethality is dynamically robust across tactical spaces. Hard Light is an Exotic Auto Rifle. The good: High rate of fire, Volatile Light perk is fun. The bad: Impact and range are low. Conclusion: Needs more Impact and/or a non-Kinetic damage type to be truly effective. 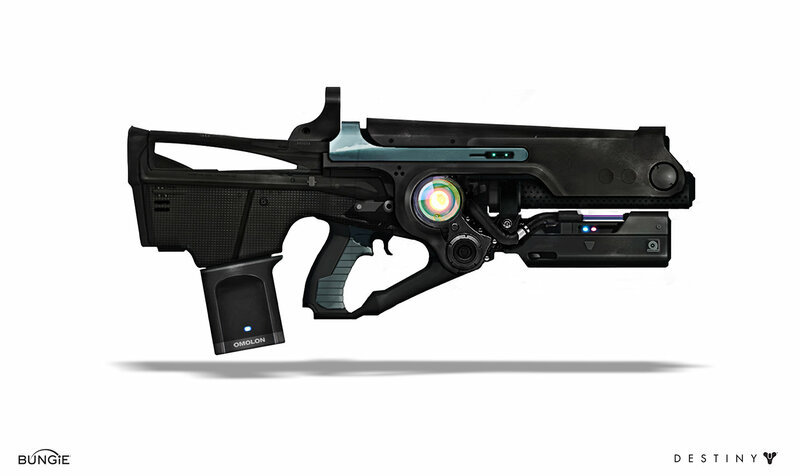 Hard light is an Exotic auto rifle that can be won in the Cryptarch lottery, as a reward from PvP/PvE, or sold by Xûr. Its signature Volatile Light perk allows for overpenetrating targets, and ricochet rounds. Okay, so if we’re being encouraged towards giving it a shot, what are we looking at? Unfortunately, not much. Before we delve into it too deeply, you should know that Hard light is a middling-to-outright-bad Exotic weapon, even in the best of hands. It might be fun to use, and has its upsides, but all-in-all you’d be better served with another Exotic. Still, if you want to hose down enemies in style, we’re here to help you make the best of it. The Volatile Light perk that gives overpenetration and ricochet rounds is actually very fun to use, but not very practical. While you won’t be shooting things around corners, the ricochet rounds can add some unexpected damage to an encounter. Coupled with the overpenetrating rounds, this weapon can turn any corridor into a meat grinder of sorts. Once the weapon is fully upgraded it really does shine. It’s easy to dominate mid-range fights with Hard Light. The weapon does a bit better in PvP. As it shares damage output with For the People and Up For Anything, it does possess the ability to down opposing Guardians in a timely fashion. Predictably though, this still means getting up close and personal; you’re not going to be picking anyone off across the map with its abysmal Range. And with that pesky Auto Rifle nerf, Range has become all the more important. Its sights are unobtrusive by themselves, allowing for a nice Field of View, but once you begin firing you may entirely obscure your target with the bright blue flash that Hard Light emits. This is particularly annoying when in one-on-one strafe fights, as you may be unable to find the head of an opponent at a critical juncture. Until you upgrade this weapon, there’s much better Legendary/Exotic auto rifles that you could be using. Once you at least unlock the Glass Half Full perk though, it starts to feel much more controllable and powerful. The high rate of fire coupled with the high recoil means you’re going to be spending a lot of time reloading and missing rounds if you’re not really careful. Thankfully the stability upgrade that comes with Aggressive Ballistics is very helpful, but the Impact is still going to be very low. The perks don’t allow for much customization, since most often you’re just going to go with the increased stability over anything else. Glass Half Full is basically a worthless perk. Its scaling as the magazine approaches zero is pitiful, offering marginal extra damage even on the last few bullets. It may snag you a rare extra kill in PvP, but the overall effect on DPS is literally negligible. It does function best on large magazine sizes such as Hard Light’s, but Hard Light would be better served by almost any other perk – for example, Persistence. Finally, we arrive at Hard Light’s signature Exotic perk, Volatile Light. Volatile Light is a flavorful combination of Armor Piercing Rounds and Skip Rounds, but for an Auto Rifle. It’s a cool idea, and we can see where Bungie was angling with this one: a high magazine capacity automatic weapon whose rounds stay in the fight to ricochet and overpenetrate for maximum damage on several foes – unfortunately, Destiny isn’t designed for this weapon. There are very few situations in which Volatile Light truly stands out. It works well for lines of thrall, of course, but what doesn’t? You could work into a gimmicky strategy of shooting around corners or at the ground in front of enemies, but this is all just ignoring the principle role of a weapon, which is to dispatch single foes quickly with accuracy. Ultimately, Volatile Light is a disappointment. 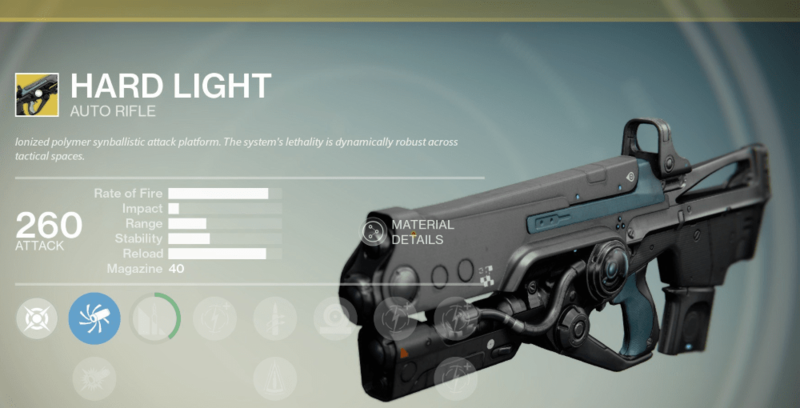 Like most Auto Rifles, Hard Light is currently struggling to keep up in PvE. Its damage is simply too low. It requires a constant stream of uninterrupted critical hits to dispatch enemies reliably, and this is difficult and a chore with its exaggerated, unpredictable recoil pattern and obtrusive visual effects. Although it theoretically is able to compete just fine in the category of DPS, the reality is you have to be too close and out of cover for too long to make use of its strong points. Most Hand Cannons, Legendary or otherwise, outperform it in close-to-medium range fights, where minimizing time out-of-cover and making shots count is paramount. At medium-to-long range, the newly buffed Pulse Rifles and always-solid Scout Rifles are better options that can reliably string critical this together. Hard Light unfortunately has no way to patch its Range to workable levels. Up For Anything sneers at it with Rangefinder coming standard on the Vanguard Vendor’s option, and other Legendaries have the potential to roll Hammer Forged, etc. Hard Light is doomed to be an aggressive front-liner, where it is still completely outclassed. To top it off, it costs you an extremely valuable Exotic weapon to use it. Although you may have fun with Hard Light in low-stress content such as strikes and the Daily Heroic, you are doing your fireteam a disservice if you insist on using it in Raids or Nightfalls. This weapon is a little bulky, and takes up more of your screen than other weapons do, though it’s not distractingly large. It has the same aesthetics as a pulse rifle (rear loading magazine, general bullpup design). Hard Light has a very signature sound. It almost sounds as if you are firing off concentrated rounds of light. It has a very airy noise to it that is easily recognizable, utterly unique and enjoyable. The gun oozes power in its feel, it’s just too bad this isn’t replicated in its performance. As the City’s understanding of Golden Age methods expands, foundries continue to push the cutting edge of tactical armament. The Hard Light prototype is a showcase, built with the rarest recovered materials and the most computationally demanding design methods. The design team included several specialist Exos and at least one Warlock thanatonaut. In its current iteration, the Hard Light design fires a superheated polymer round with exotic capabilities. Hard Light has a very interesting effect on its wielder. It quickly grows on you, and is deadly in PvP once you’re able to master it, but worthless for PvE. Glass Half Full is a drop in the bucket at best, while its ballistics and third row perks are barely enough to patch it to the standards set by its Legendary counterparts. It has a minute niche of suppressing fire with its large magazine Size and fast reload, but this is hardly enough to compensate for its shortcomings. Volatile Light is a neat idea with very little practical application, and the “coolness” factor of the weapon is almost a slap in the face for how little it has to actually offer. It would benefit greatly from more Impact or a non-Kinetic damage type (such as Arc damage). Previous Post:Twerk it Dreg, Twerk It!